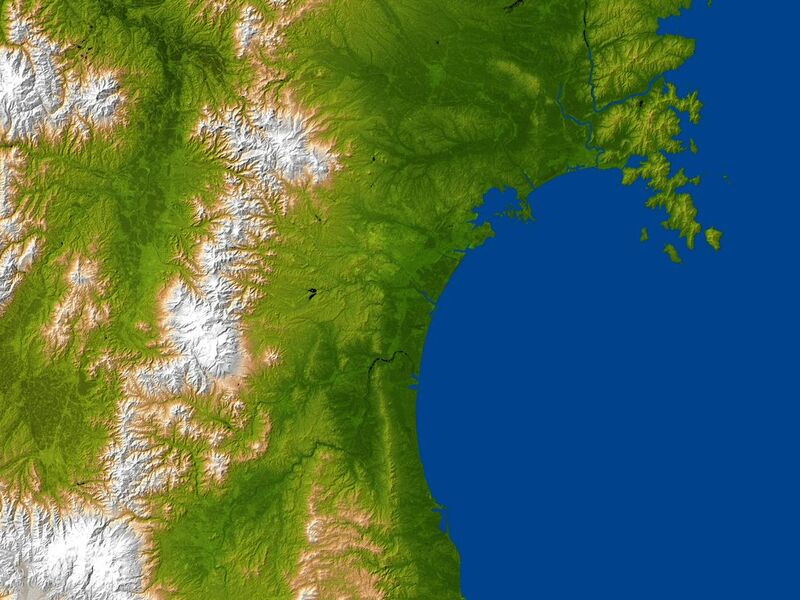 The topography surrounding Sendai, Japan is well shown in this combined radar image and topographic view generated with data from NASA's Shuttle Radar Topography Mission (SRTM). 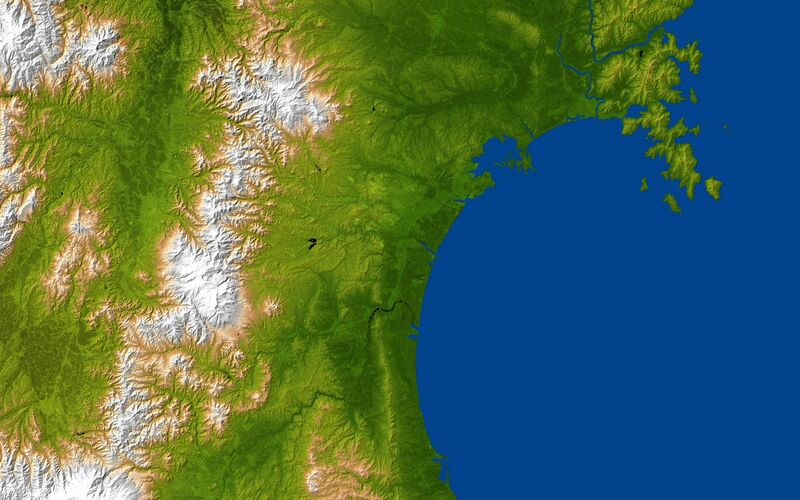 On March 11, 2011, a magnitude 8.9 earthquake struck offshore about 130 kilometers (80 miles) east of Sendai, the capital city of Japan's Miyagi Prefecture, generating a tsunami that devastated the low-lying coastal city of about 1 million residents. 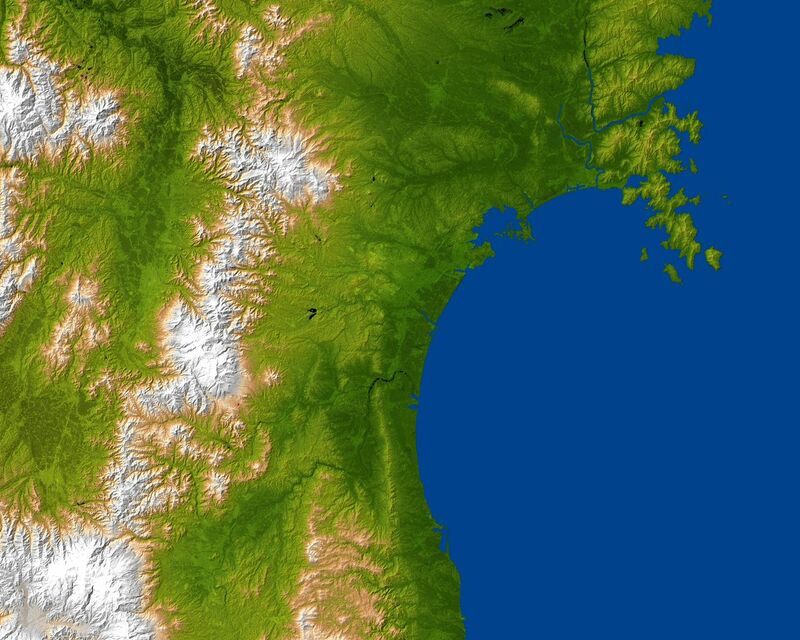 The city is centered in the image and lies along the coastal plain between the Ohu Mountains and the Pacific Ocean. The eastern part of the city is a low-lying plains area, with the city center being hilly (the city's official elevation is about 43 meters, or 141 feet). Sendai's western areas are mountainous, with its highest point being Mt. Funagata at an elevation of about 1,500 meters (4,921 feet) above sea level. According to the U.S. Geological Survey, the earthquake occurred as a result of thrust faulting on or near the subduction zone interface plate boundary between the Pacific and North America plates. At the latitude of this earthquake, the Pacific plate moves approximately westwards with respect to the North America plate at a velocity of 83 millimeters per year. 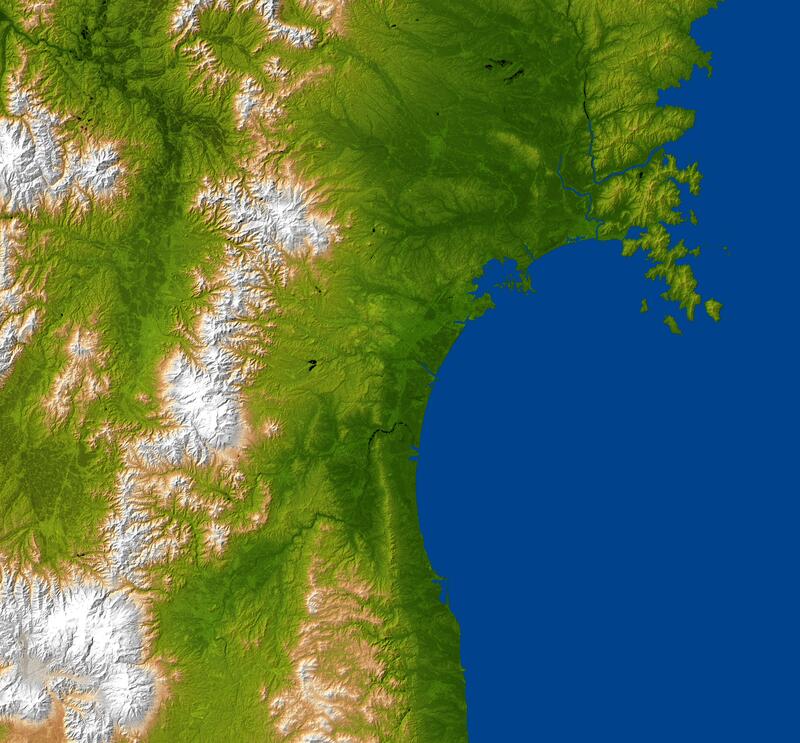 The Pacific plate thrusts underneath Japan at the Japan Trench, and dips to the west beneath Eurasia. The location, depth, and focal mechanism of the March 11 earthquake are consistent with the event having occurred as thrust faulting associated with subduction along this plate boundary. This image combines a radar image acquired in February 2000 during the SRTM mission, and color-coding by topographic height using data from the same mission. Dark green colors indicate low elevations, rising through yellow and tan, to white at the highest elevations. SRTM flew aboard the Space Shuttle Endeavour, launched on Feb. 11, 2000. SRTM used the same radar instrument that comprised the Spaceborne Imaging Radar-C/X-Band Synthetic Aperture Radar (SIR-C/X-SAR) that flew twice on the Space Shuttle Endeavour in 1994. SRTM was designed to collect 3-D measurements of Earth's surface. To collect the 3-D data, engineers added a 60-meter (approximately 200-foot) mast, installed additional C-band and X-band antennas, and improved tracking and navigation devices. The mission is a cooperative project between NASA, the National Geospatial-Intelligence Agency (NGA) of the U.S. Department of Defense and the German and Italian space agencies. It is managed by NASA's Jet Propulsion Laboratory, Pasadena, Calif., for NASA's Science Mission Directorate, Washington, D.C.